Red Star Bar & Grill – eating my way through Charm City! I imagine tourists rarely walk down Fells street in Fells point. But, I think they got their name from when sailors used to dock in the harbor. Maybe that is why I like this place, the exposed brick, the history, and the fact that you can often grab a seat at the bar and a few drinks. There is a slightly more sophisticated and cultivated feel at Red Star, compared to most of Fells Point. But, its warm and approachable, and they have a few TVs, so you can catch some of the games. This was the first stop on a Sunday Funday, mostly because they have some great food choices, including huge salads. I stuck with wine first for a little while. 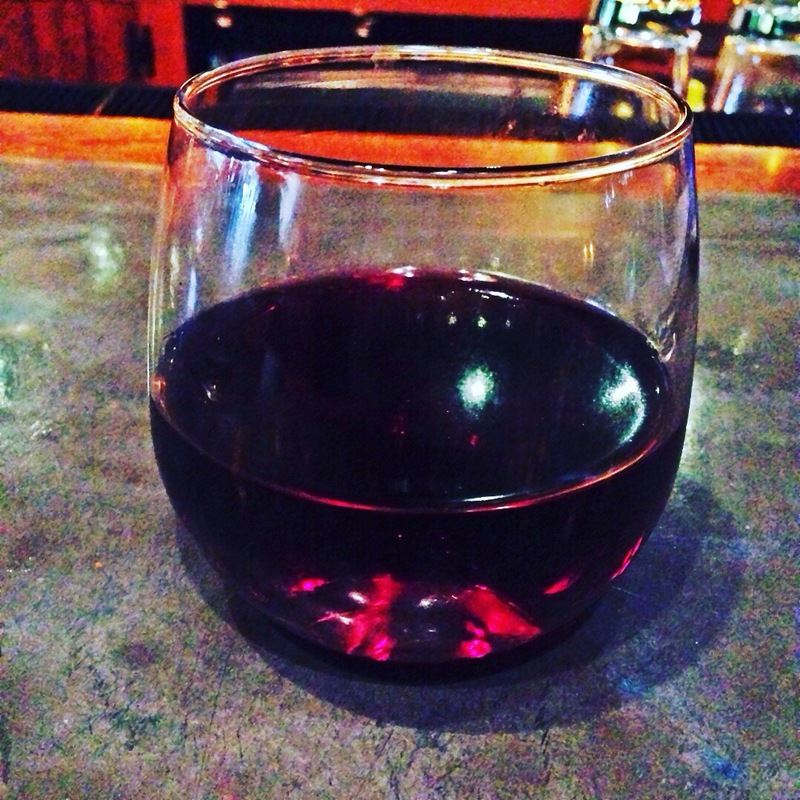 A smooth, medium bodied pinot noir from Poppy. I think Ronny was trying to give us a hint with the stemless glasses. But, hey, I said it was Sunday funday. After snacking a little off my friend’s plates, I eventually ordered. 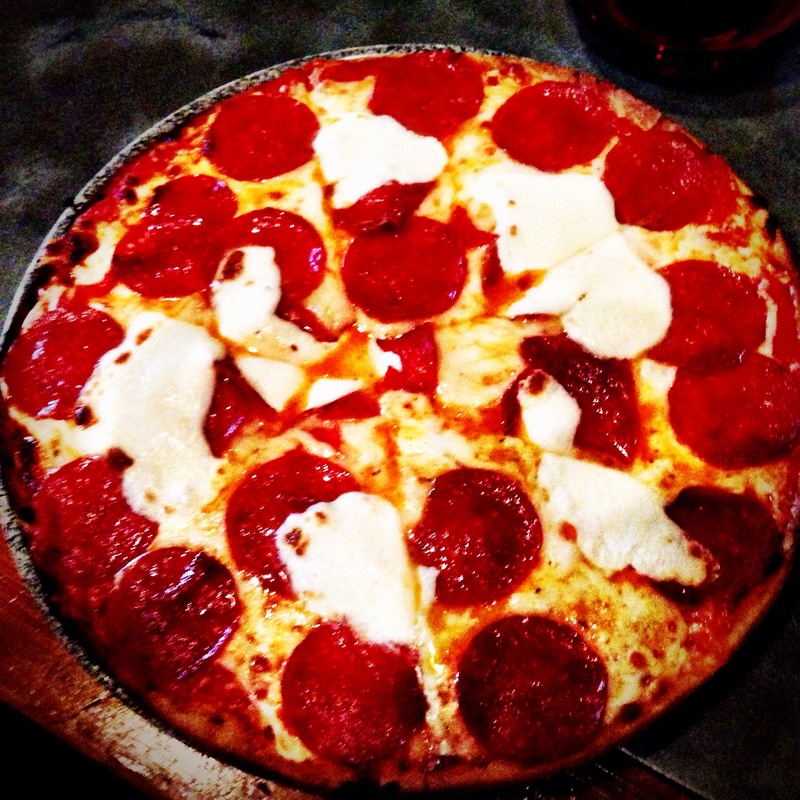 I skipped the salads, and went for the pizza – classic style with cheese and pepperoni. There are a ton of choices with some gourmet ingredients. It took a little while to come from the kitchen. And, as I was getting to the spot where I was wondering where it was, the bartender told me they burned it. So, they had to make a new one. When I finally got it, I was super excited. It was tasty. They have a super thin crispy crust, which is how I generally like my pizza. This one had three cheeses – fontina and mozzerella for great melting cheeses, and some parm to add some tang. I had a hard time finishing, as my eyes were much hungry than my stomach. Luckily my friends helped out by picking off the pepperonis. This entry was posted in All Good., Canton, Charm City, Drinks, Fells Point. Bookmark the permalink.